Triad's behind-the-wall loudspeaker line is geting an upgrade in the form of a 2-way version. As with all speakers in Triad's DesignerSeries invisible speaker line the DS700se fits behind the wall where it will be completely undetectable, and out of the way. Triad claims the DS700se speakers are ideal for home theater applications, especially where space is a concern. 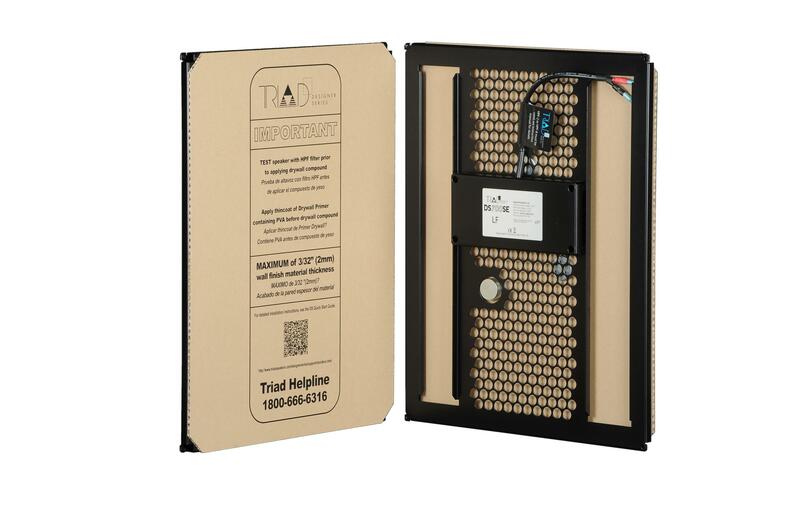 Triad Speakers, Inc. is now shipping its first 2-way invisible loudspeaker. Called the DS700se, the behind-the-wall system is comprised of two vibration panels per channel: one for high frequencies with another for lows. Each panel is fed by an external crossover / limiter. The net result is a fuller frequency response (50Hz - 20 kHz); improved mid-range and treble, and greater power-handling (200 Watts peak per channel) than available from the company's single-panel models. Given its low-frequency capabilities, the DS700se is ideal for home theater and distributed-audio applications that require a high- performing yet completely concealed loudspeaker. The DS700se is the latest addition to Triad's DesignerSeries invisible speaker line (which consists of 7 single-panel models). Like all the invisible models, the DS700se panels are comprised of a powder-coated aluminum frame, an extremely rigid aluminum honeycomb core with paper skin covering, and electro-mechanical drive devices. The drive devices are transducers comprised of the finest rare earth neodymium magnets. The transducers, which function much like magnets and voice coils in a traditional loudspeaker system, are attached to the aluminum honeycomb core which serves as the vibrating element to generate sound waves. The DS700se panels easily fit between the wall studs in typical home construction; their depth requirements are less than two-inches. The panel's paper skin provides a high-bond surface for excellent adhesion to plaster, drywall compound and mud skims. Learn more about Triad speakers here. Read a review of the Triad In Room Gold LCR speaker a HomeTheaterReview.com. Check out Niles "invisible" in-wall subwoofer at HomeTheaterReview.com.